The CALIFORNIA AIR TOOLS 4610AC-22050 Ultra Quiet & Oil-Free Air Compressor is designed to be one of the quietest air compressors in the industry having only 60 decibels of sound. The CAT-4610AC-22050 Air Compressor has a Oil-Free Dual Piston pump designed to have a life cycle before wear of 3000 Plus hours compared to other comparable air compressors with life cycles of 500 hours or less. The Oil-Free pump allows for use in a variety of temperatures and uneven terrains. 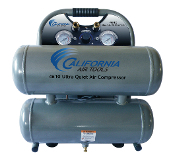 The 4.6 Gallon Aluminum (Rust-Free) Air Tank is Lightweight (44 lbs) and very easy to transport.